In Part 1 we learnt about pipes, while in Part 2 we learnt about Planning and Scheduling of pipe transport operations. In this part, we will learn about Engineering. Engineering for pipe transportation is an intriguing subject. The shape of the cargo demands unique ways of stowage and lifting. Category 1 – Calculations and Analyses for the pipes. 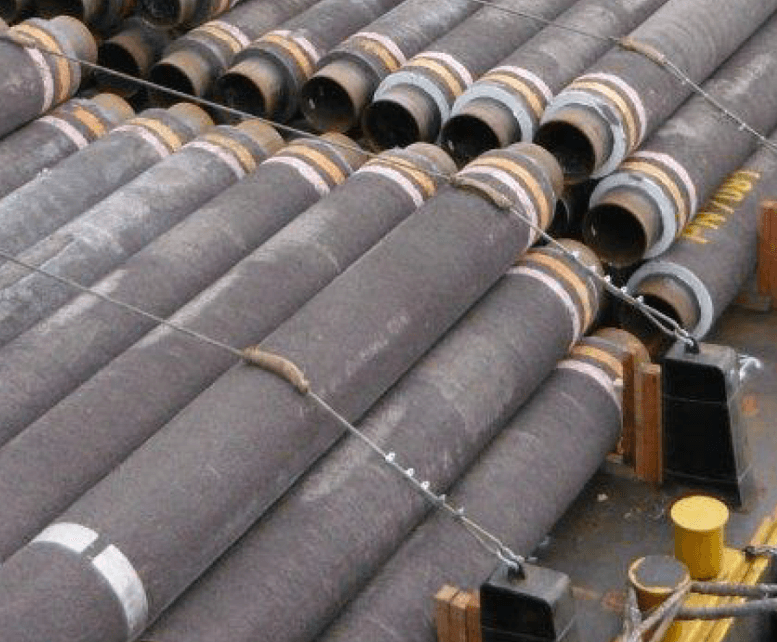 The pipes to be transported may be of varying dimensions and weight, and each pipe type needs to be studied for its own requirements of lifting and stowage. Pipes need to be lifted at the yard to be loaded on to the vessel. They also need to be lifted from the vessel to be fed to the lay barge. Thus, a lifting plan for the pipes needs to be in place. 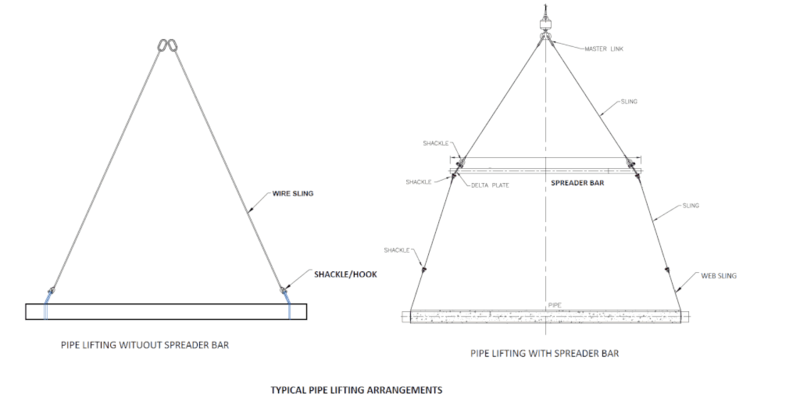 A simple lifting configuration for pipes is to have a two-sling lifting arrangement. In this arrangement, one end of each sling is connected to the pipe while the other end goes to the crane hook. The end connected to the pipe has a soft eye which is large enough to accommodate the pipe. Masterlinks are used to connect to the hook end. 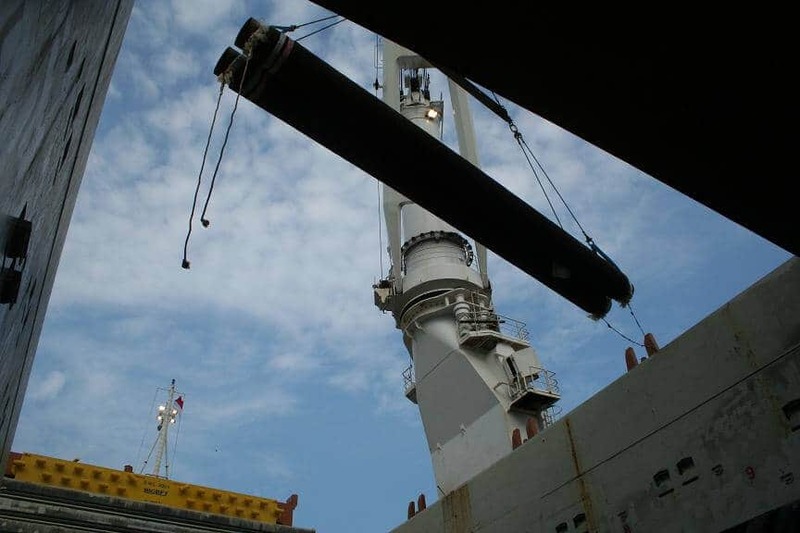 In some cases, a spreader bar is used between the crane hook and the pipe. Separate slings are used to connect between crane hook & spreader, and between the spreader bar & pipe. Shackles are used to connect between the pipe and slings. Using a spreader leads to smaller slings being used which may be operationally more manageable. In some cases, a webbing sling may be used to go around the pipe. The lifting plan should be prepared in thorough discussions with the Operations team. In some cases, more than one lifting plan may have to be prepared to cater to different pipe types being lifted. Whatever lifting arrangement is used, the lifting plan must clearly state the specifications and quantity of each item used in lifting. Further, for each lifting plan prepared, a supporting lifting calculation must be prepared to demonstrate the adequacy of the lifting arrangement. GL Noble Denton Guidelines (Ref , ND-0027) is the guiding document for lifting design. Strength check – Each item of the lifting arrangement must be checked for its strength. These include the shackles, pad-eyes, slings, spreader bars, webbing slings, masterlink, delta plate etc. Usually a check against WLL is sufficient, but in some cases Shear and Bending Stresses need to be checked too. MWS Approval – The Lifting plan and calculations should be submitted to the MWS for approval before any operation commences. Category 2 – Transportation Analysis for the vessel(s). The first action required is to prepare a stowage plan for the selected vessel. For simplicity, we will limit discussion to vessels which can stow only on the deck. Stowage in Cargo holds will not be covered in this article. What is a stowage plan? It is a plan showing the way pipes are going to be loaded on the vessel. Let’s take an example of a simple barge of length 76 m and width 30 m. Let the clear available deck space on the vessel be 66 m x 26 m. Pipes are to be loaded on this vessel. 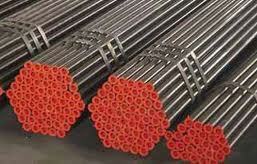 Pipes are generally stacked with their lengths oriented along the length of the vessel. This is called Longitudinal stacking. Pipes can also be stacked with their lengths along the vessel’s width (Transverse stacking) but it is not a preferred method. Load pipes on the forward end of the available deck space. The bottom tier will span 26 m wide. Keep loading tiers above the bottom tier till the stacking height limit is reached. This is the first stack of pipes. It is also called a ‘Bay’. Its length is the length of one pipe = 12.2 m.
Start loading pipes behind (or aft of) the fwd Bay. For lifting and manual handling of pipes, we need to keep a clear spacing between the fwd Bay and the second bay (minimum 400 mm). In a similar fashion, keep loading pipes in second bay till the stacking height limit is reached. Load the next Bay aft of the previous one. Keep repeating this process till the aft end of the available deck space is reached. Loading in the above fashion, we will arrive at a stowage plan as shown in the figure below. Usually the number of bays possible to be loaded on the vessel can be decided from some initial calculations. We will derive the formula for the number of bays possible. Let the available length of deck space be Ld, the spacing between bays be s, and the length of a bay (same as pipe length) be lp. Let the number of bays be nB. The number of spacings between bays is one less than the number of bays. The number of spacings is one less than the number of bays. In the present case, Ld = 66 m, lp = 12.2 m, smin = 0.4 m. This gives n <= 5.26. Since n must be an integer, n <= 5. Thus, the maximum number of bays possible is 5. Using this nB = 5 in the Eq(1), we get the actual spacing between bays as s = (66 – 5 x 12.2)/(5-1) = 1.25 m or 1250 mm. One good way of representing the stowage plan is to use an excel spreadsheet. Once the number of bays is known, we can create a spreadsheet showing all the bays, and the number of pipes stacked in each bay. 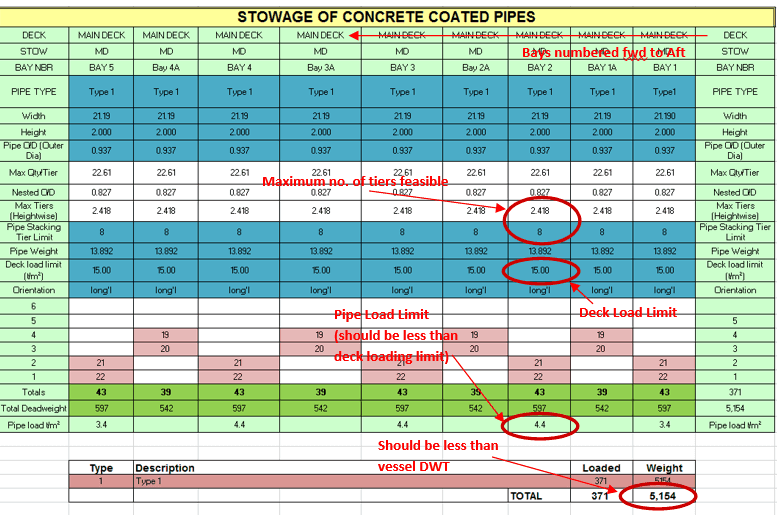 The spreadsheet can also be used to calculate the total weight of pipes in each bay and on the vessel. Numbering of bays – Usually bays are numbered beginning from fwd end. The foremost bay is Bay No. 1, the one aft of it is Bay No. 2 and so on. Deck Loading Limit – The deck of the vessel will have a limit to the load it can take. It is usually specified in tons per sq. m. In the spreadsheet, the deck loading of each bay must be calculated, and it should be ensured that the deck loading limit of the vessel is not breached. It may so happen that we may not be able to load pipes upto the stacking limit because the deck loading is reached earlier. Height restrictions for manual handling – For manual handling of pipes, there are restrictions on the maximum height of a bay of pipe on deck. Generally, a maximum height of 2 m is followed. It may happen that the stacking height limit of the pipe is more than 2 m. In such a case, the maximum tiers possible will be dictated by the height restriction of 2 m, and not by the stacking height limit. Trim by aft – Usually in marine transportation, a slight trim by aft is preferred when the vessel is in sea (see Ref ND 0030). This can be achieved by ballasting the vessel. However, trim by aft can also be achieved by arranging the pipes and adding more pipes aft than forward. This is a sensitive exercise and should be done with caution. Vessel’s capacity – We may be able to load pipes on all bays upto the stacking height limit, but the total weight of pipes loaded must be less than the maximum Deadweight (carrying capacity) of the vessel. 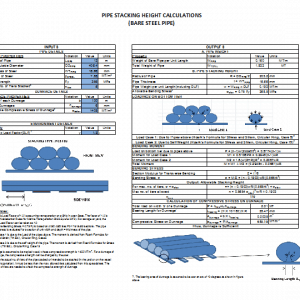 If the total weight of pipes is exceeding the deadweight, then pipes should be removed till the total weight of pipes is less than the deadweight. Multiple pipe types in holds and deck – If two or more different types of pipes are being loaded in a vessel which has loading in both holds and deck, then the pipes which are to be unloaded first should be loaded on deck, and those to be unloaded later should be loaded in holds. 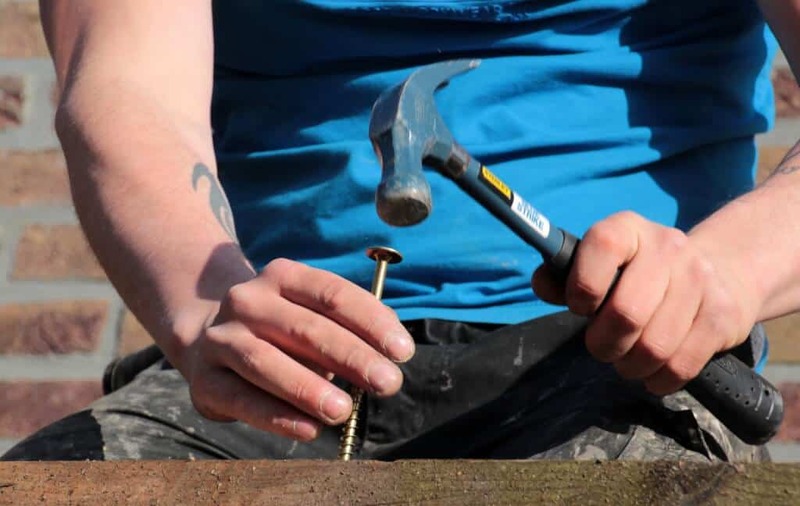 From the above we can see that preparing a stowage plan is an exercise fraught with multiple constraints, and requires caution and experience. 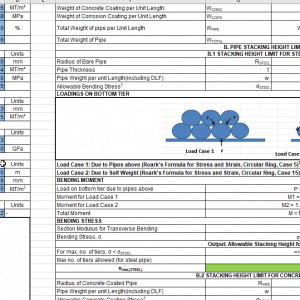 thanavalarch has its own spreadsheet developed for pipe stowage plans on vessels with only deck loading. You may check it here. The next step is to collect the data on the environment which the vessel will experience along the route. The data includes the wind, wave, and current parameters. These are very critical inputs in the analysis, because they will determine the forces which the vessel and the pipes experience in the sea. Environment data can be obtained from Nautical Charts, or from a data provider like Metocean. The data for the relevant window of transport should be obtained, and the most extreme environment during the window should be used for further analysis. Reading and extracting environment data is a separate exercise, and will not be dealt with in this article. We will move on to the next step – the Ship’s trim, stability, and strength evaluation. 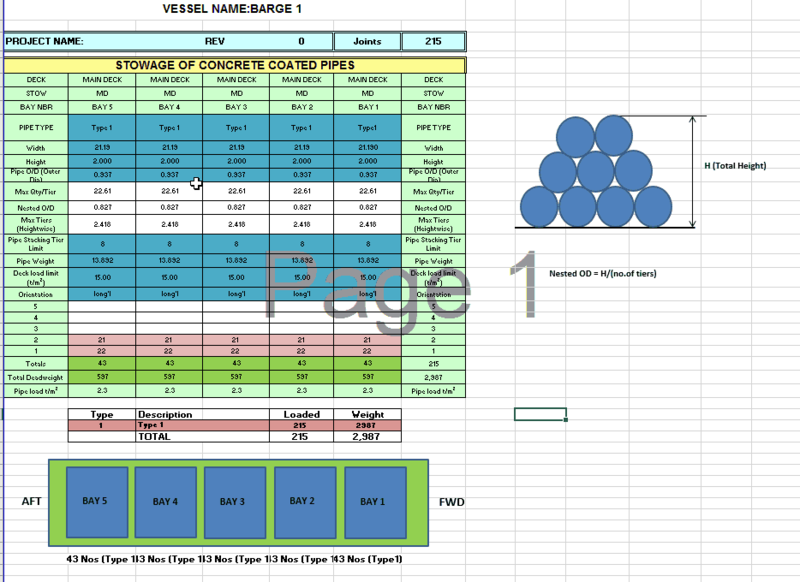 If the vessel has a loading computer onboard, then the stowage plan can be sent to the vessel’s Master who performs the stability and strength evaluation and sends back the report. Generally loading computers are installed onboard all merchant vessels, but not on unmanned barges. If the vessel doesn’t have a loading computer, but if it has stability booklet with all required information (like trimmed hydrostats and cross curves), then hand calculations can be performed to check trim and stability. However, hand calculations are not always accurate and dependable. If the vessel doesn’t have loading computer or reliable data, then the stability can be evaluated by modeling it in a computer software like GHS, Maxsurf, NAPA, Autohydro etc. For this, the linesplan of the vessel should be available. Generally, this method is adopted for barges, for whom credible data or loading computer is not available. Hog and Sag – Tanks should be ballasted to avoid making the vessel experiencing too much hog or sag. For example, if the pipes have been loaded more around the midship, the vessel will tend to sag. In such case, ballast tanks of aft and forward should be utilized to correct the sag. If ballast tanks around midship are filled, the sag will increase and longitudinal strength may be compromised. Once the Loading plan is prepared, we can check the equilibrium floating condition of the vessel. The floating hydrostatics will provide the draft, heel, trim, VCG, KM, GM etc. The floating condition stability should be evaluated against the standard rules of IMO Stability. Conventional IMO rules relate to sea going merchant vessels as per IMO RESOLUTION A.749 (18) Ch 3. There are separate IMO rules for Stability of non-self-propelled Barges. These are in IMO Res A 749(10) Sec 4.7. These can be followed for barges. For conventional ships, both departure and arrival conditions should be checked. For towed barges, only one loading condition needs to be checked. The longitudinal strength of the vessel should be checked using a computer software. 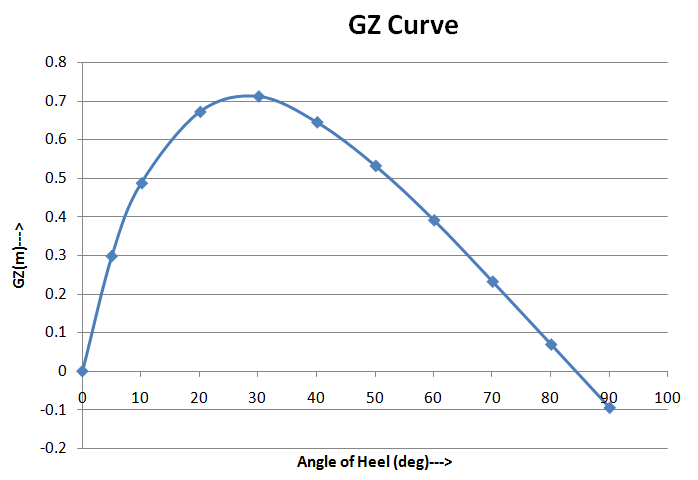 The Shear Force and the Bending Moments resulting from the check should be within the limits of the vessel. In a vessel with loading computer, the limits are available. 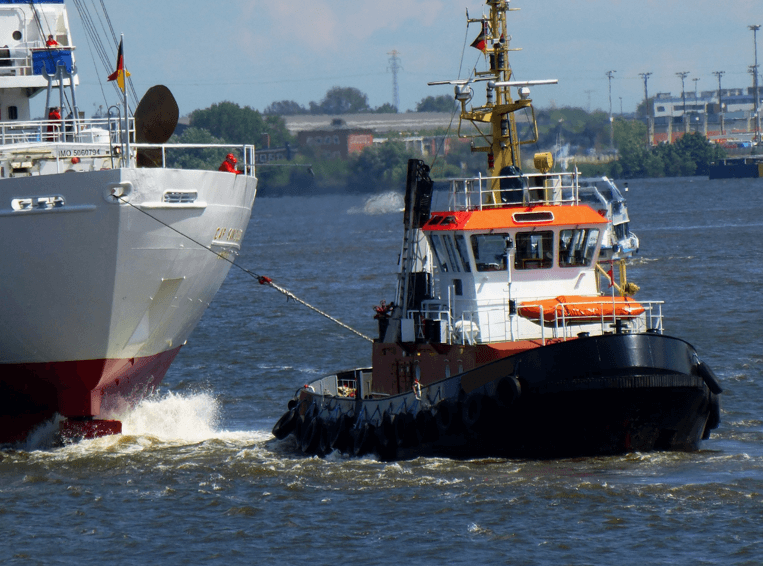 However, for vessels like Barges, these limits are not available, and they can be calculated from some Class rules available (e.g., ABS Rules for Barges). If the longitudinal strength requirement is not met, then the loading condition is not appropriate. It needs to be modified. For example, if the vessel is failing in sagging condition, this means there is too much load near midship. The load needs to be transferred to fwd and aft parts of the vessel. This can be done using ballast tanks. In some cases, rearranging the pipes (provided there is space) can also achieve the desired results. At this stage, the stowage plan has been prepared and stability of the vessel evaluated. 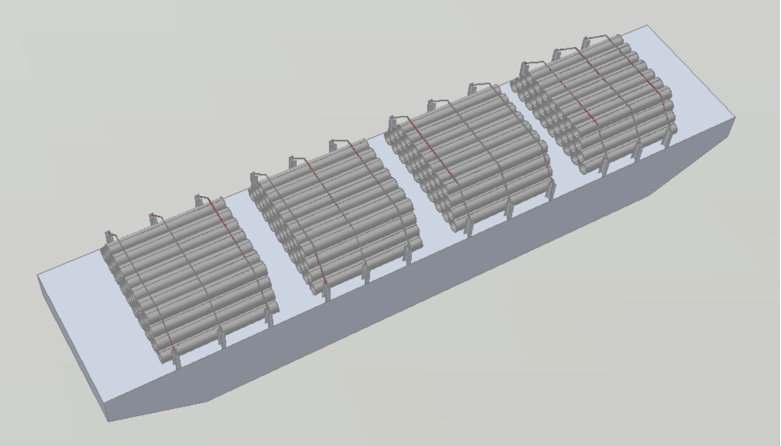 Next step is to do a motions analysis of the cargo (i.e., pipes). What is a motions analysis and why do we need it? A motions analysis is an analysis done in a computer software to calculate the motions and accelerations which the vessel and its cargo will experience in the sea in the given environment. The results of motions analysis are the forces/accelerations acting on the cargo in the three directions – Longitudinal, Transverse and Vertical. It also gives the maximum magnitude of the six motions of the vessel – roll, pitch, heave, surge, sway and yaw. Motions analysis requires sophisticated computer software. In case a motions analysis cannot be performed, the alternative is to follow industry guidelines like Nobledenton Guidelines for Marine Transportations (See Ref ND-0030, Sec 7.9). From motions analysis, we will know the motions and accelerations at the different bays of pipes. The most conservative results will further be utilized for seafastening calculations. Readers may like to check thenavalarch’s product ‘Cargo Forces and Accelerations’ based on Ref ND-0030. Considering its vastness, a detailed discussion on motions analysis is out of scope of this article. We will move on to the next step which is seafastening calculations for the pipes. Perhaps the most niche section of the Transportation Analysis is the seafastening calculations for the pipes. Due to the unique shape and stowage plan of the cargo, unique engineering solutions have to be deployed for the seafastening of pipes. First, what do we mean by seafastening calculations? Seafastening is the way the cargo will be ‘fastened’ or secured to the deck of the ship during transport. It is obvious that we cannot be transporting the stacked pipes on the ship without somehow securing them to the deck. This is because the pipes are subject to forces and motions (see previous section), and they may be lost to the sea if not secured. Talking about securing pipes to the deck, the first solution which comes to mind is to tie ropes around them and secure these ropes to the deck of the ship. This actually is the way pipes are secured to the deck of the ship. However, this is not the complete picture. Let us consider one-by-one all the different forces and motions which the pipes experience, and what securing solution to devise for them. 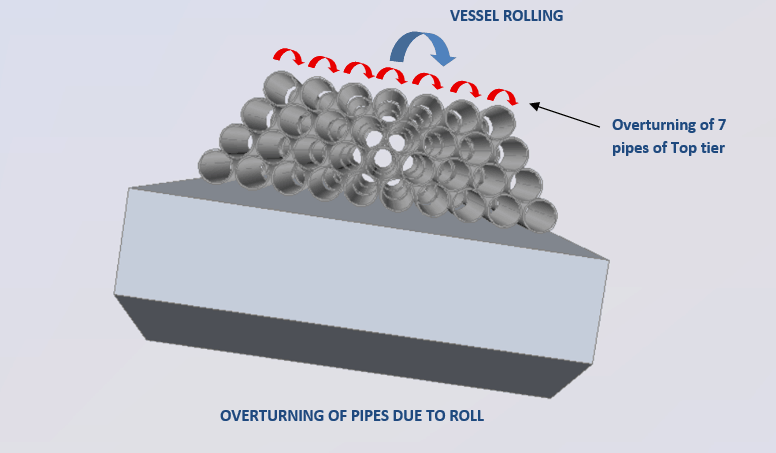 Rolling motion of the ship (pipe overturning) – when the ship rolls to one side, the pipes loaded on the ship tend to roll over. This is called the overturning of pipes, and is depicted below. Rolling leads to an overturning moment on the pipe. 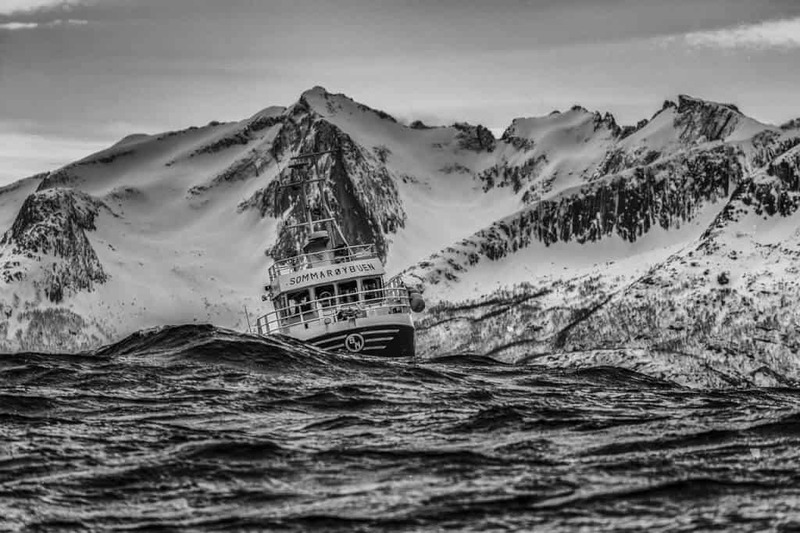 To prevent this overturning, lashing ropes can be utilized. These ropes run across the bay of pipe and are secured to the deck. From engineering calculations, it should be demonstrated that the ropes are strong enough to contain the overturning of a complete tier of pipes. These are called pipe overturning calculations. Pad-eyes are welded on the deck to secure these ropes to the deck. The calculations should also demonstrate the adequacy of the strength of pad-eyes. Pitching motion of the ship and longitudinal forces (pipe sliding) – when the ship pitches, the pipe tilts along its length. Due to this tilt, there is slipping between two tiers of pipes. The top tier of the pipe may slide over the tier below. Slipping also depends on the magnitude of pitching experienced. The longitudinal force experienced by the vessel adds to this sliding force. Transverse forces on ship and stanchions – the transverse acceleration of the ship results in the bay of pipes swaying to the side of the vessel. While lashing across the bay prevents the overturning of the pipes, it may not be sufficient to hold the pipes from swaying. This transverse motion of the pipes is contained by providing ‘stanchions’ on the ship. A stanchion is a vertical beam which is welded to the deck of the ship. 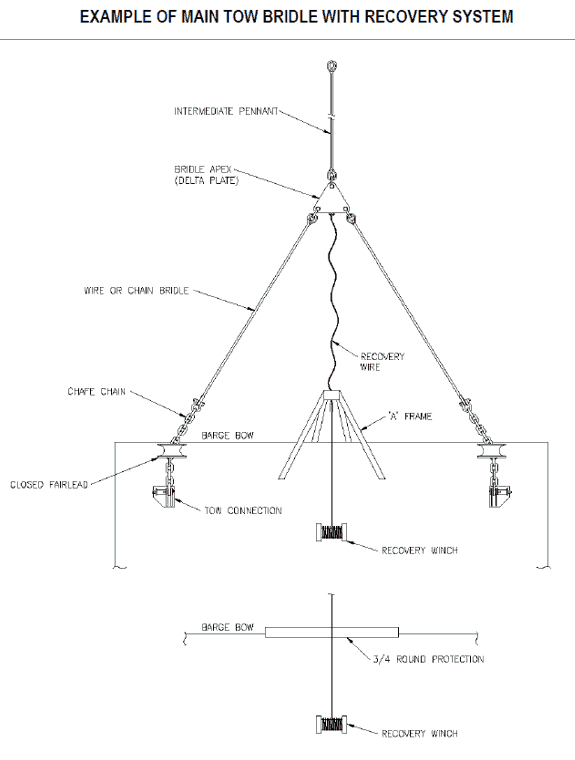 Mostly for pipe transport operations, an I-beam stanchion is the most preferred design. The pipe bays rest on the stanchions on the sides (see figure below). All the transverse forces on the pipe bays are taken by these stanchions. A vessel may have existing stanchions which may be utilized, or new stanchions may be welded, depending on the requirements and forces experienced. In any case, engineering calculations and analyses are required to demonstrate that the stanchions are fit for the purpose. Sometimes a FE Analysis may also be needed. 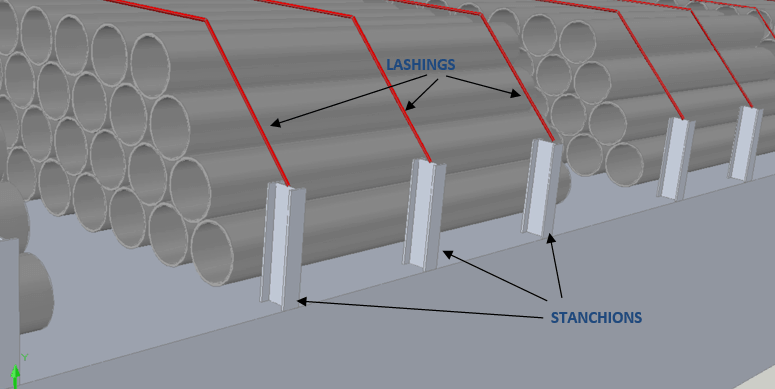 Based on the results of Seafastening design, the whole lashing plan to secure the pipes to the vessel needs to be prepared. The following items are part of the lashing plan of the vessel. Lashing ropes to prevent overturning – Wire ropes are generally used for this purpose. Generally, wire ropes with both ends soft-eye are utilized. Pad-eyes or D-rings – Pad-eyes or D-rings of adequate strength need to be welded to the deck of the vessel to tie the lashing ropes. In some cases, pad-eyes are welded to the top of stanchions. 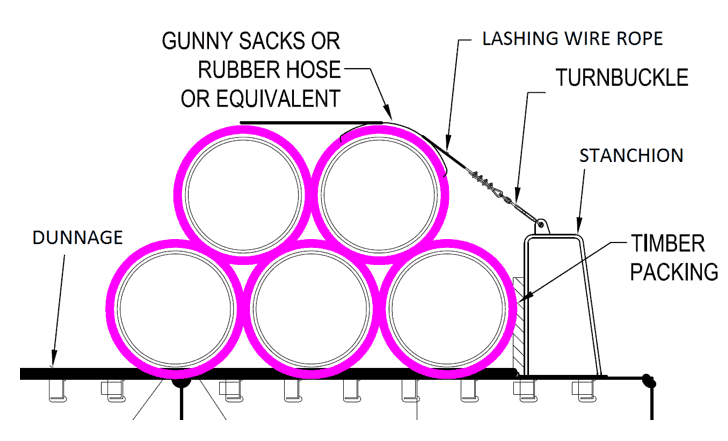 Gunny sacks or rubber hose – To protect the pipe from damage by wire rope, gunny sacks can be placed between pipe and rope, or rubber hoses can be fitted to the wire ropes. For lashing in cargo holds, there is no need for stanchions, since the walls of the hold provide the securing against transverse forces. To check overturning on partially loaded holds, a few pipes on top tiers may be bundled together using rachet straps to prevent the overturning. Besides the stowage plan, the lashing plan is the most important document for the operations team. They follow it religiously, and so it should be prepared with great care and caution so as to avoid any hassles in operations. Get the environment parameters. These are the wind speed, current speed, and significant wave height of the tow route. In case the environment data are not available, the standard open ocean conditions as specified in Ref  ND-0030 may be used. It specifies a wind speed of 40 knots, current speed of 1 knot and significant wave height of 5 m.
Calculate the environmental forces on the vessel due to the wind, current and wave. Wind force calculation will require transverse windage area of the cargo and vessel. Once total force is calculated, divide it by towing efficiency of the tug to obtain the required bollard pull. The selected tug’s bollard pull must be greater than the required bollard pull. thenavalarch has its own spreadsheets for Bollard Pull calculations for Barges and Ships. You can check them here. 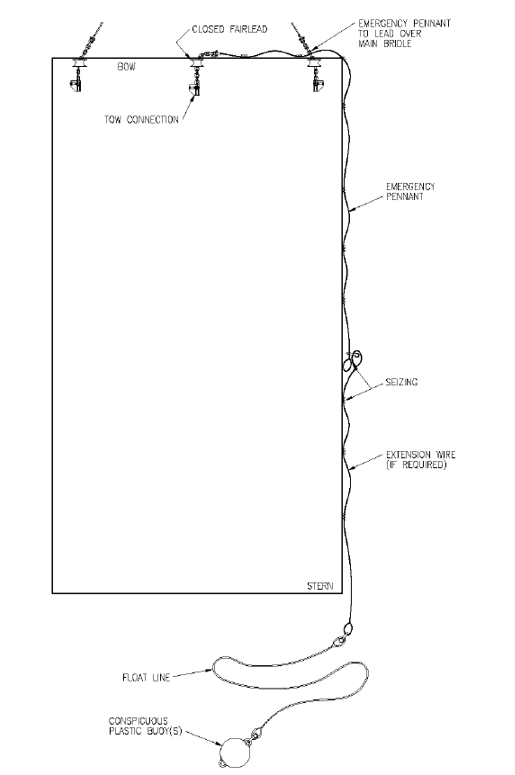 Once the Bollard Pull is known, a towing plan of the vessel is to be prepared. The guidance to be followed is in Ref  ND-0030. A standard towing arrangement with two smit brackets, two towing bridles, a delta plate and a towing rope is shown below. The towing plan should clearly specify the items to be used for towing, their ratings and quantity. Similarly, an emergency towing plan needs to be prepared as per requirements in ND-0030 (Ref ). This should also specify all the required items for emergency towing of the vessel. That brings us to the end of this section on Transportation Analysis. The entire transportation analysis document needs approval from the Marine Warranty Surveyor (MWS) before the actual operations can begin. The engineering team should work actively with the MWS, resolving any outstanding comments from MWS to ensure that all approved documents are in place for the operations team to start their work. Phase 4 – Execution of actual operation. With Engineering done and approved documents in hand, the operations team will execute the entire pipe transport operation involving lifting, loading, securing, transportation and unloading. However, the engineering team is required to be actively involved throughout the operation of the project to support the operations team. By their very nature, these operations have a knack of springing up surprises every now and then, and the engineering team will most likely be more occupied during the actual operation of the project than during the engineering phase. Hope this article was helpful to you. If yes, please do remember to share it with others who can benefit from it. Disclaimer: This post is not meant to be an authoritative writing on the topic presented. thenavalarch bears no responsibility for any incidents or losses arising due to the use of the information in this article in any operation. It is recommended to seek professional advice before executing any activity which draws on information mentioned in this post. All the figures, drawings and pictures are property of thenavalarch except where indicated, and may not be copied or distributed without permission.